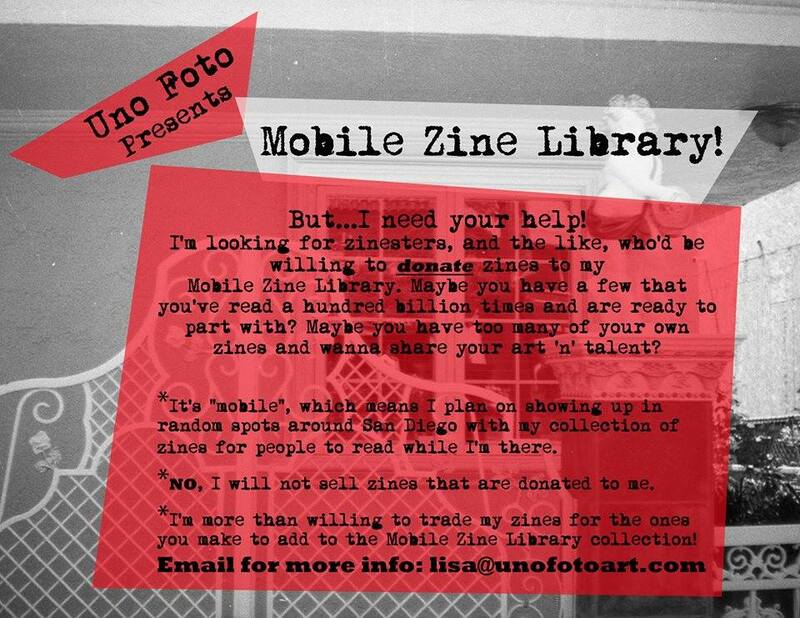 San Diego-based Mobile Zine Library asking for donations! So, I decided I want a Mobile Zine Library! I don’t have a truck, but being mobile doesn’t require a big ol’ truck. Anyhow, I need some help starting it. I’ve got a fair amount of zines now, but I’d love to have an even greater variety to lug around and share. I plan on having the first Mobile Zine Library “event” near the end of November (location TBA in San Diego), but I will also be visiting my hometown of El Paso, TX and plan on sharing the zine love there too. Feel free to email me with more questions! What a great way to get some new zines! I hope to see this zinemobile on the streets between San Diego and El Paso soon. < Freeways Collide at Space 15 Twenty this Sunday, Nov. 10!